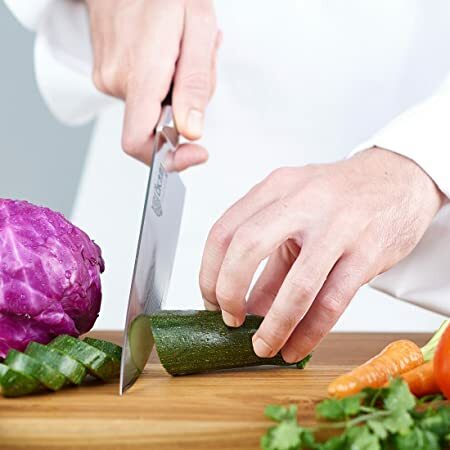 All cooks must have the basic best kitchen knives being a paring knife for small veggies and fruits, a utility knife, a chef’s knife, and a knife that slices. 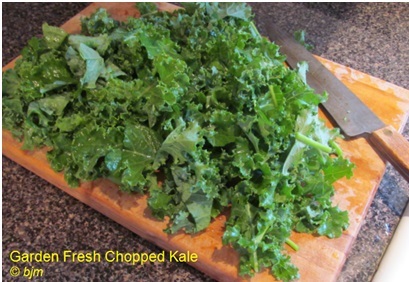 I like a cook’s knife, my best friend for slicing and dicing on my wood cutting board. Plastic is not recommended as a cutting board because it harbors bacteria. Wood naturally has a bacteria killer in its chemical components when a tree. Plastic can be put in the dishwasher or soaked in the soapy dish suds, and yes, wood needs cleaning each time never to be soaked to warp it and never ever put in the dishwasher. Wood chopping blocks or cutting boards, even though made of hardwood, is soft to the edges of knives unlike hard plastics. Never use marble, tile, or stone for cutting on. One of my friends uses the back of a saucer, so I gave her a wooden cutting board for her birthday. Back to knives. Forged steel is the best for dicing, chopping, and routine use. They are sturdy, durable, and easy to handle never bending like stamped steel, and are more expensive worth every penny. You will want the best quality, razor-sharp and easy to hold knife there is. You might be a beginning cook and want a set or just a few pieces or be an experience cook or chef wanting something new and low in price. Some people like knife sets in wood blocks and some want to store them off the counter top in a drawer. Whatever your preference, some metal knives are safe to put into the dishwasher on the top rack only lying flat and not touching anything that can dull or chip the blade. Be sure to check your instructions from your specific brand manufacturer. They are so easy to clean, so you might not want to risk using the dishwasher. Care—Stainless-steel will not rust and you can cut acidic foods such as citrus, tomatoes, and rhubarb without harm. Carbon steel blades will rust when contacting acidic foods or left wet. A carbon steel blade will hold its sharpness better. Always cut your food on preferably a hardwood cutting board. Wood is soft and will protect the blade. Some people use plastic cutting boards and they are hard surfaced to damage the knife blade. You will need to wash wood and plastic cutting boards with dish detergent under very hot water after each use, especially when cutting raw meat. It’s best to keep the knives separate from other utensils. They wash up by hand quite well with dish detergent, a good rinse, and towel drying. Dishwashers can damage knife blades, they bang around to damage the blade, and the heat of the water and drying function will contract and expand the entire knife including the sharp blade and can nick the blade as well. Sharpening—Steel knives need consistent sharpening to keep the clean, razor sharp edge. Use a typical honing steel, whetstone, or the electric knife sharpeners. Knife sharpeners attached to electric can openers are not effective. You might be interested in an electric high-powered diamond knife sharpener for steel blade knives. Diamond sharpening wheels are used and they are wonderful. See more about sharpening in Tips at the end of this page. Storage—Because the knives can chip and become dull, they need to be protected in your utensils drawer not touching other items. It is recommended they be put in the plastic sleeve or blade guard sheath they came in, or bought separately. Some knives come in a wooden block to store each one individually according to size, and this will keep the knives sharp and safe. Some sets have a box they came in to keep them in, and you can also hang them on a magnetic strip. 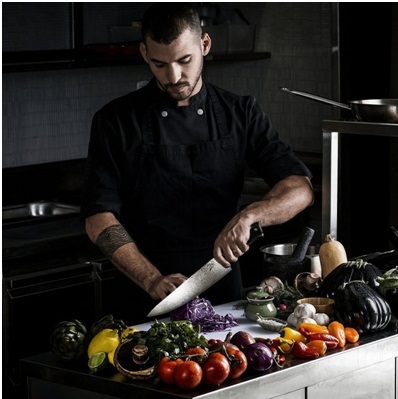 Chef’s Knife—the most versatile knife to have to chop, dice, mince, and slice produce and a variety of ingredients. Paring Knife—used for small-task produce slicing such as clove garlics, herbs, coring and intricate cutting for decorative garnishes. Carving Knife—also called a slicing knife is used to carve and slice fillets of meat, poultry, and fish and its long blade ensures large and even slices. Slicer—Granton edge designed for thinly slicing roast beef or other roasts and the superior edge prevents thin slices from sticking to the blade. The Granton is a one-piece stamped blade, not a forged blade. Bread Knife—serrated edge cleanly slices French bread and baked goods. 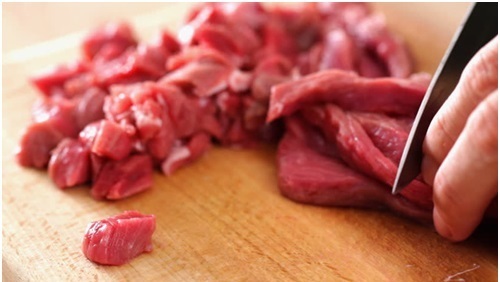 Fillet Knife—sharp blade allows you to remove membranes from meat and meat from bones precisely and easily. Boning Knife—stiff or flexible, the narrow blade gives control to separate meat from the bone and trim fat. Tomato Knife—the serrated edge allows the knife to easily penetrate the skin of the tomato. Utility Knife—also called a sandwich knife is the absolute in-between knife for day-to-day cutting tasks. 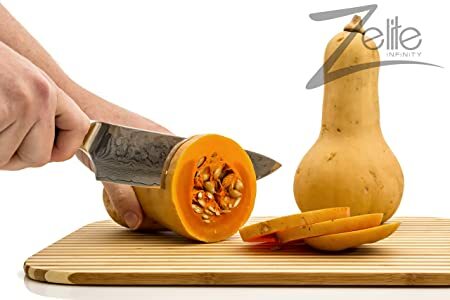 Peeling Knife—also known as a bird’s beak knife, peels vegetables or fruit with a curved surface with delicate precision and shapes them as desired. Fork—an extension to any chef’s hand, holds food steady while carving or turning meat usually having 2 sharp prongs. A full-tang extends the full length of the gripping part of a handle, versus a partial tang which does not. A full-tang may or may not be as wide as the handle itself, but will still run the full length of the handle. Read more about the fascinating subject, tang here. 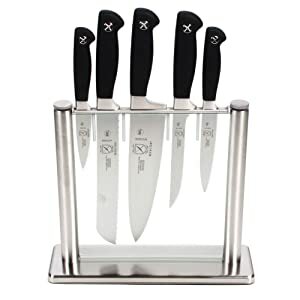 The Mercer Culinary® forged high-carbon German steel set of 5 knives (Amazon title shows 6 knives, but you get 5) with model number M20000. 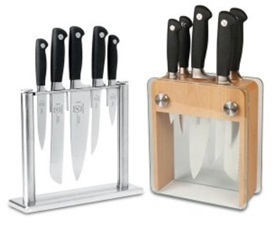 You can choose either the solid tempered glass block or glass with wood block for your knife storage. The block may be counted as the sixth piece. Professional chefs and home cooks use these alike. 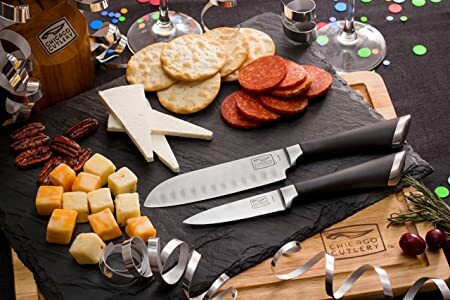 The set consists of a 3.5-inch paring knife, a 5-inch utility knife, an 8-inch chef’s knife, and a bread knife along with a 6-inch boning knife and they will not stain, rust, or corrode. They are a brushed finish rather than shiny. The glass holder is washable removing 2 thumb screws. The blades are so acute they will cut through a rock-hard turnip and carrots like butter. They will not, however, cut through bone! You would need a butcher’s knife, a cleaver, or bone saw to carry out that task. They will remove meat from bones however. The Rockwell hardness (HRC) of these knives is 58. For knives, the “C” scale is in units labeled “HRC.” High-carbon steel kitchen knives run from HRC 56-58. The sharpening angle is about 20-degrees and the blades are razor-sharp. The blades are made of X50CrMoV15 steel and that stands for 0.5% carbon, the other 15% is composed of 14% or 14.5% of chromium (Cr), some Mo and V. X in the name is an indicator for high-alloy steel, 0.5% carbon (C) content means, by definition X50CrMoV15 isn’t a high-carbon steel, despite of some marketing claims. However, it’s tough and resists corrosion well and it is a high alloy steel. If you don’t want to bother maintaining your knives this is a good choice. The ergonomically Santoprene®, a rubber and plastic compound black handle for a good grasp in your hands that doesn’t get hot, or slip when your hands are wet is a good material. The full-tang is the best and runs the full length of the handle giving you great balance and safety. With the tapered ground edges, you will have more hand stability and sharpness for a longer time chopping and cutting. Wash by hand for best results. Dishwashers can tarnish the handle and metal. The knife block holder with knives in it is 14.5-inches tall and will fit under modern upper kitchen cabinets. Not only is the block with knives beautiful on your counter top, these knives are functional, well-engineered, and designed. Gift-wrapping is available for family and friends and the items are packaged in a lovely box as well. You will receive a User’s Manual and a Limited Lifetime Warranty. The high-quality steel is from Germany and manufactured in Taiwan. Mercer Culinary® Genesis® Collection video. The Wüsthof® USA comes from The City of Blades in Solingen, Germany and the company has been crafting blades since 1814 from the Wüsthof family and continues to make its blades with the city name on them. Long renowned as “The City of Blades,” Solingen, Germany has earned the reputation of creating the world’s finest cutlery for generation after generation. These are one of the finest fashioned blades there are. They are einfach wunderbar (simply wonderful)! 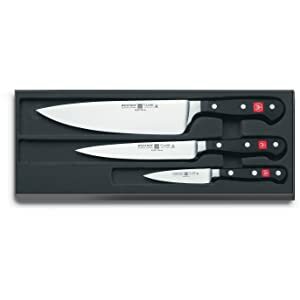 They are one of the best kitchen knife sets around. The 3-piece cook’s set – 9608 is a best seller on Amazon.com® and has been a best seller for generations. 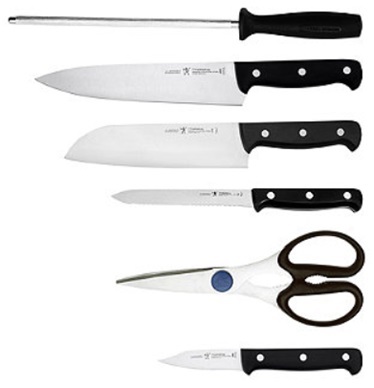 The Classis Collection includes a 3-1/2-inch paring knife, 6-inch utility knife, and an 8-inch cook’s knife. The knives are full-tang made of 1-piece high-carbon steel. It’s 20% sharper and keeps its sharpness. The Rockwell hardness (HRC) of these knives is 58. These are standard blades and not the Asian type. The black handle is made of synthetic Polyoxymethylene (POM) having a tighter molecular structure to resist fading and discoloration with 3 rivets and the famous red Trident logo. 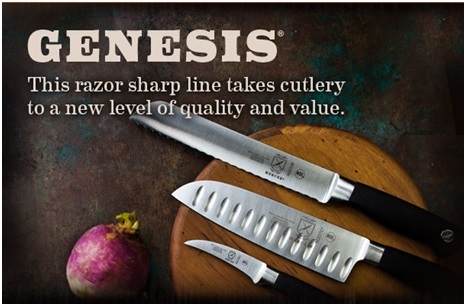 You might like to know this is indeed the Classic and not the Gourmet collection of knives. The less expensive Gourmet knives are stamped and are not forged as the Classic knives are. The sharpening angle is at 14-degrees. Wüsthof® does not recommend an electric knife sharpener but using a honing rod, also called a sharpening steel instead for best results. 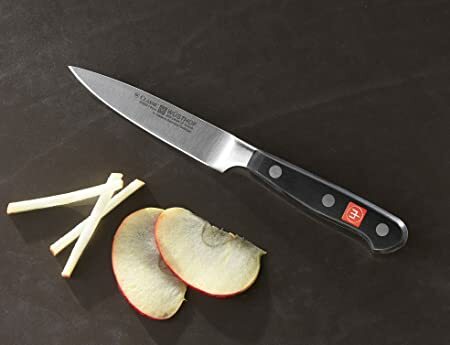 The 3-1/2-inch paring knife is the most used in any kitchen to fit into the hand letting the point do the work to trim and peel small food items such as clove garlic, herbs, and coring apples. These are dishwasher safe, but handwashing will have them stay nice longer. Dishwashers seem to make them need to be sharpened sooner; maybe it’s the harsh detergent and extremely hot water. They do not come with a knife sheath blade cover. You can store them in the lovely box they come in tucked into a kitchen drawer. Gift-wrapping is available for family and friends and the items are packaged in a lovely knife separator box included. You will receive a User’s Manual and a Lifetime Warranty against manufacturing defects. They are made in Solingen, Germany. 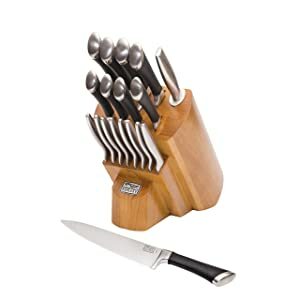 The Chicago Cutlery® model number 1119644 Fusion® stainless-steel knives come in its own wooden block for convenient storage when you need to quickly grab one. It is a top seller on Amazon.com® and can also be purchased with 2 wood cutting boards in small and large with a manual knife sharpener. The set is not expensive. 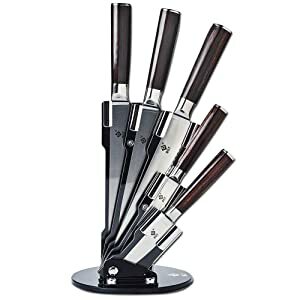 The knife set includes many diverse knifes to include 8 each 4.25-inch steak knives to have a matching set for your guests. The handles are stainless-steel and the blades are not serrated but are super sharp to cut through any steak or roast like butter. The other knives are a 3.25-inch paring knife, 3-inch peeling knife, 5-inch utility knife, a 7.75-inch chef’s knife, an 8-inch slicing knife, 7.75-inch serrated bread knife, 5-inch Partouku, 7-inch Santoku, and a convenient 8-inch stainless-steel sharpening rod. 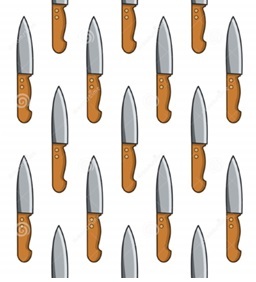 The Rockwell hardness (HRC) of these knives is 58. If you are not familiar with a Japanese Santoku knife, it means 3 virtues: chopping, dicing, and mincing. It is a straighter knife where the edge is almost flat, not being curved and is all-purpose. It’s lightweight and super sharp with a great angle for cutting. They combine “scalloped” sides, called kullens, also known as a Granton edge, and keep a more uniform thickness from spine to blade. Partouku™ is the trade name for Chicago Cutlery’s® Santoku knife. The knives have a tapered grind edge for maximum sharpness and precision cutting made of high-carbon stainless-steel forged blades with a comfortable to hold plastic handle. With high-carbon steel, the blade is stronger and harder never getting rust, stains, or pits on it. They are full-tang. 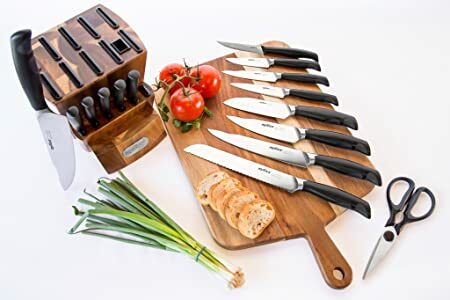 The value for all you get for the stained pine wood block and the many knives is unbeatable and it will look gorgeous on your kitchen counter top. Wash your knives by hand and towel dry for many years of use. The dimensions are 12-inches front to back, 7-inches wide and 10-inches high not including the knives; with the knives it’s 13-inches tall. The set weighs about 10-pounds. 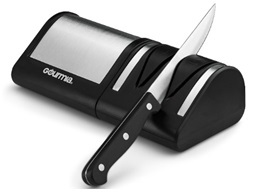 Gift-wrapping is available for family and friends and the items are packaged in a lovely knife separator box included. You will receive a User’s Manual and a Limited Lifetime Warranty against manufacturing defects. The knives are made in China. 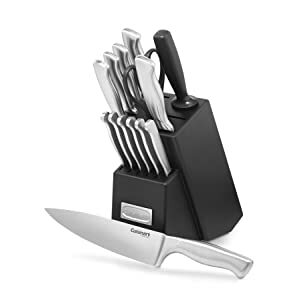 Chicago Cutlery® – (Every Knife Up Close) Fusion® Forged 18-Piece Knife Block Set (1119644) excellent video. The J.A. 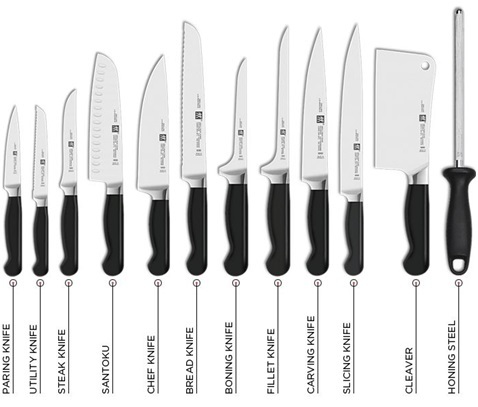 Henckels International brand was established in 1895 as a separate value brand of Zwilling J.A. Henckels, Solingen, Germany. J.A. 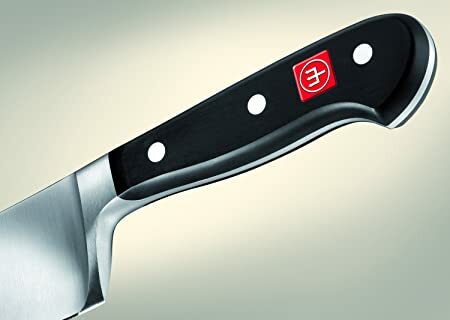 Henckels International produces knives for the price and worth conscious customer who wants a quality product for their everyday needs at the best cost. Germany produces some of the world’s best kitchen knives. 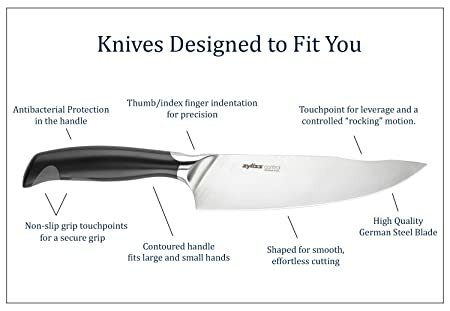 Being designed and crafted for all uses, model number SYNCHKG109689 is a set that has a 3-inch and 4-inch paring knife, 6-inch utility knife, 5-inch hollow edge Santoku knife, 8-inch chef’s knife, a 5-inch serrated utility knife, a 9-inch long sharpening steel, and a pair of kitchen shears with a natural wood block to keep all your knives together in a handy place. There are 6 knives, scissors, sharpening steel, and a wood block to total 9 pieces. The knives are safe in the dishwasher, but hand washing is best for a long life. Gift-wrapping is available for family and friends. You will receive a User’s Manual and a Limited Lifetime Warranty against manufacturing defects. The knives are made in China. J.A. Henckels International – Knife Skills video. An 8-inch chef’s knife, an 8-inch slicing knife, a 7-inch Santoku knife—great for cutting cheese and sticky stuff, a 5.5-inch serrated utility/bread knife, a 3.5-inch paring knife, a 3.5-inch bird’s beak paring knife, an 8-inch sharpening steel, all-purpose household shears, and the block to hold them all. The block of wood is painted black matte and is easy to clean made of sturdy material. 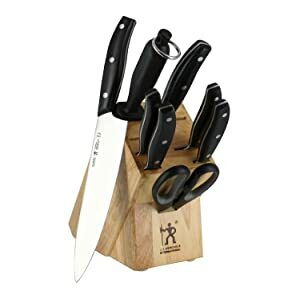 The block set also has matching 6 each 4.5-inch hot-forged steak knives you can be proud to use at your dining table. They are lovely, the edges are serrated to glide through steaks, and pointed too, not rounded for a great cutting edge. The handles won’t slide in your hand being a brushed finish. 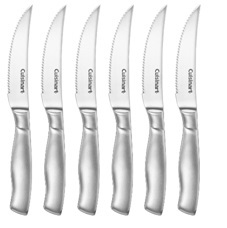 All the knives in the set are made of top-quality high-carbon stainless-steel blades for exactness and accuracy. All of the knives are lightweight not being too heavy to handle. The tapered ground blades ensure a fine and sharp edge with the gradual tapering from handle side of the blade to the tip. The knives are full-tang. The knives are safe in the dishwasher, but hand washing and towel drying is best for longevity. The set weighs 8.1-pounds. Cuisinart® Stainless-Steel Hollow Handle Block Set Demo video. The ZYLISS® Swiss innovation company offers its professional cutlery knives that are made of German steel. The model number E920165U has a lovely wood look storage box with antibacterial removable knife sheaths that fit right into the slots in the box. The blades are forged, not stamped. 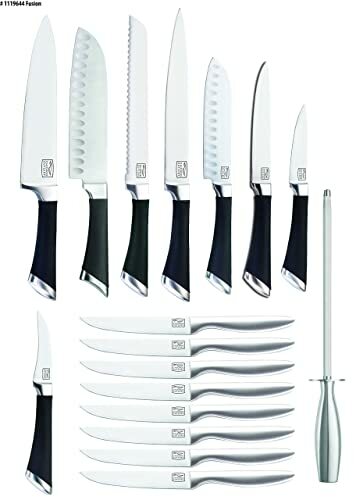 You will receive in this set an 8-inch chef’s knife, a 5-inch Santoku knife, an 8-inch bread knife, an 8-inch carving knife, a 5.5-inch utility knife, a 3.5-inch and 4.5-inch paring knife, a 4.5-inch serrated paring knife, a pair of kitchen and household shears with 6 serrated steak knives. The handles are easy to grip made of black plastic and are full-tang. The faux wood box is sturdy and has rubberized nub feet so it will not slip or slide around on your countertop. The dimensions are 8.46- x 10.75- x 14.76-inches weighing 11.55-pounds. The knives are safe in the dishwasher, but hand washing and towel drying is best for la long life. Gift-wrapping is available for family and friends. You will receive a User’s Manual and a Lifetime 25-year Warranty against manufacturing defects. 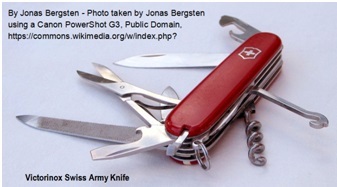 The knives are designed in Switzerland and made in China. The Best Gift Trading Co., Ltd. (BGT) Japanese kitchen knives are made of stainless-steel with a light color faux wood plastic handle. 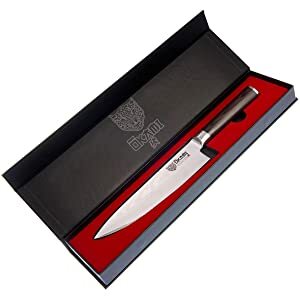 You will receive a 3.5-inch paring knife, 5-inch Japanese utility knife, 7- and 8-inch chef’s knife, and an 8-inch bread knife in a storage box. Knife sheaths do not come with this set. The Rockwell hardness (HRC) of these knives is 58. For knives, the “C” scale is in units labeled “HRC.” The knives will prepare veggies, fruits, herbs, and remove the flesh from meat, fish, and poultry, but do not cut through bones. The handle is smooth and easy to hold and the blade edges are super sharp made of high-quality stainless-steel. The package dimensions are 15.1-inches long x 3-inches wide x 1.2-inches deep weighing about 3-pounds. The knives are safe in the dishwasher, but hand washing and towel drying is best for endurance. Gift-wrapping is available for family and friends. You will receive a User’s Manual and a Lifetime Warranty against manufacturing defects and breakage. The knives are designed in Japan and made in China. The Zelite family-owned company is registered in the UK. 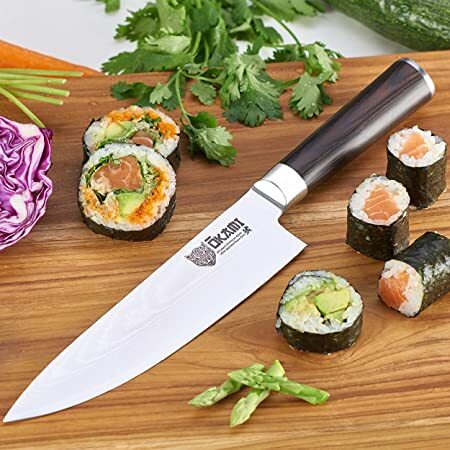 They are makers of an excellent quality Japanese VG10 Super Steel with 67 layers of Damascus high-carbon stainless-steel and is razor sharp, with superior edge retention, is stain and corrosion resistant in chef’s knives. Professional chefs, executive chefs, culinary students, and home cooks too enjoy this stellar best chef’s knife. This knife is no ordinary knife. It will impress everyone with its style, abilities, and good looks. You will like its heft, slicing resistance, full-tang, and superior materials it’s made from. It comes packaged in a stylish box for storing. It is a non-stick Gyutou (chef) Japanese Tsunami (flowing water) rose Damascus pattern and is liquid nitrogen tempered for lifelong performance. You will soon be butchering chickens and cutting them up like an ace with this rust, stain, and corrosion resistant 8-inch blade. The Rockwell Hardness is HRC 61 ±1 for a sharp edge that is maintained for a long time if correctly used. The entire knife measures from the tip to the end of the handle 13-1/8-inches and weighs 9.6-ounces. The knife is about 2 to 2.3mm thick at the spine near the bolster and tapers to about 0.3mm at the tip. The black handle is rounded with 3 metal mosaic Zelite classic rivets made of military grade G10 Garolite and forged. The tapered bolster provides great hand comfort with superb balance. The knife has a 12-degree razor edge on each side, is polished to a mirror finish with the 3-step Honbazuke method. Japanese chef (Gyutou) knives have a reputation for their lightweight and thin blade that maintains a long edge retention. Without effort on your part, you can slice meat, fish, poultry, including Sushi, veggies, fruits and more, even hard-shell winter squash. You will have the great rocking motion and it chops with no exertion. Gift-wrapping is available for family and friends. You will receive a User’s Manual and a Lifetime Warranty against manufacturing defects and breakage when purchased directly from Zelite Infinity or sold by them on Amazon.com®. The knives are designed in Japan and made in Yangjiang, China. Zelite Infinity 8-inch Chef Knife video. 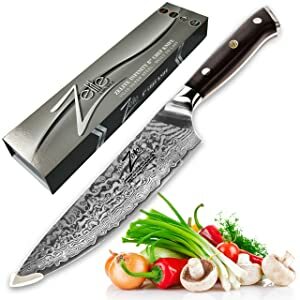 Zelite Professional 8-inch Chef Knife video. The Victorinox® company is the maker of the famous Swiss Army Knife that most of us know well, made in 1891 for the Swiss Army. It is an icon! 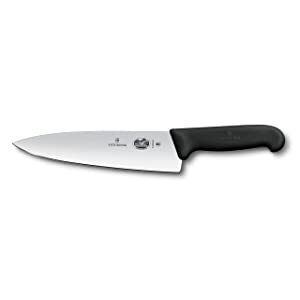 The professional 8-inch chef’s knife, model number 47520, is a best seller on Amazon.com® at an affordable price in clamshell packaging. The normal straight edge blade is 7.9-inches long, extra-wide, the handle is ergo and will not slip from your grip and weighs 7.5-ounces. The carving knife is a great all-rounder from the Victorinox® professional line of knives. They are highly valued by professional chefs and home cooks. They are well balanced and easy to use when slicing, dicing, and cutting meat and sizable items of food and are made of high-carbon stainless-steel for the blade. The stamped (not forged) high-carbon stainless-steel is a metal alloy containing relatively high amounts of carbon. The amount of carbon can be as much as 1.2% and as low as 0.2%. The reasons for this vary with the manufacturer and the type of blade they’re creating. Stainless-steel is an alloy that contains 10.5% or more of chromium (Cr) and iron (Fe) in excess of 50%. Chromium is the element that makes stainless-steel so resistant to stains and shiny. The handle is made of thermoplastic elastomers (TPE), a rubber and plastic combination for sure grip. The angle to sharpen should be the Asian 15-degrees on each side. You can use the dishwasher, but why ruin a nice knife with harsh detergent and water making things bang around? It’s not that difficult to hand wash in soapy water, rinse, and dry. It comes with a plastic sheath and is 3/4 full-tang. The blade is 2.5 mm thick near the handle, 2.2 mm about halfway to the tip, and about 5 mm from the tip. The handle is 19.3 mm thick. Gift-wrapping is available for family and friends. You will receive a User’s Manual and a Limited Lifetime Warranty against manufacturing defects. The knife is made in Switzerland. 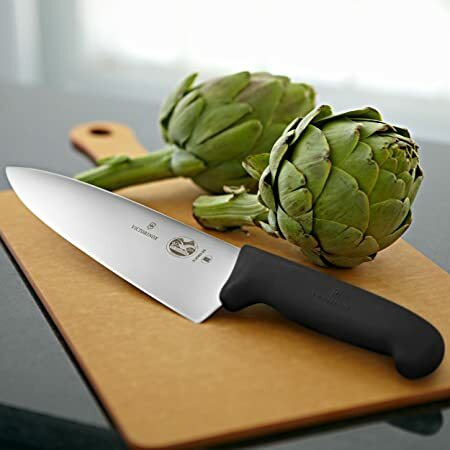 Best Review of Victorinox® Fibrox® 8-Inch Chef’s Knife 47520 video. The Ōkami knifes are well made and perfect for veggies, meat, sushi and sashimi for restaurants or home use. The knife works in Mexican, French, Italian, Thai, or Japanese Sushi Restaurants. The VG 10 steel core is imported from Japan for a high-carbon steel end product. Made of 67 layers of Damascus steel, the blade is elegant to look at and it offers great capabilities. The model number is Nakama. Japanese chef knives are some of the best in the marketplace. The edge retains its sharpness with the cobalt in the steel with 1% carbon for a great high-carbon stainless-steel product. The handle is made of pakka wood from Spain. The knife is lightweight, razor sharp and the Western style Gyutou (chef) knife. It comes with a double bevel, 50:50 ratio and a comprehensive angle of 30-degrees maximum, 12- to 15-degrees on each side. The knife has a euro beveled cutting edge, double bevel. The knife is 7.8-inches or 20 cm; the handle is 4.7-inches or 12 cm. The total length is: 12.6 inches or 32 cm. It weighs 6.98-ounces. The blade width is 1-3/4 inches and the length is 7-1/2 inches for the cutting edge. It comes with a plastic sheath cover to protect the knife. This is not a Western or Japanese knife; it is more of a hybrid—Japanese made and Western style. Gift-wrapping is available for family and friends. You will receive the knife, cleaning cloth, plastic cover, edge guard, insert, a User’s Manual and a Limited Lifetime Warranty against manufacturing defects backed by a 60-day money back guarantee. The knife is made in Yangjiang, China. 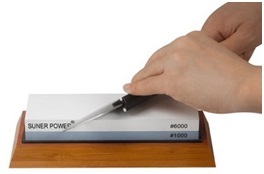 A high-powered electric diamond knife sharpener for ceramic and steel blade knives can be used. A whetstone, or a honing rod also called sharpening steel can be used to sharpen your knife blades for the best results. Be sure to check the manufacturer’s instructions for what they recommend you use. The Gourmia GES9715 is available on Amazon. For best results, hand wash your knives with soap and water and dry immediately. Soaking wood-handled knives in water can remove the natural oils from the handles, and warp them. Don’t try cutting through bone with knives, the points of knives, pry, or poke to separate frozen foods; thaw them first with warm water or put in the microwave. Don’t use knives to open cans or pry jars open; they are not screwdrivers either. You can break, bend the edge, or have it snap off to hurt you. 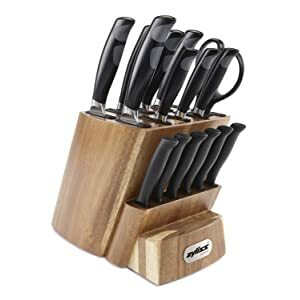 Store your knives in a safe place, a wood block, but never loose in a drawer to come into contact with other utensils. You can also use a magnetic strip. Blade protectors or sheaths are another effective way to protect the blades. Don’t use sharpeners for serrated or scalloped knife edges. If you use a sharpening steel, hold it with the pointed end down on a flat surface, work bench, or cutting board. Hold the knife at 15-degrees (11:00 and 1:00 positions). Pull the knife downwards and across the steel in a slight arc with the knife handle pulled towards you. Continue that 3 to 5 times changing to the opposite side sharpening it. To realign the edge, use a honing steel to remove the microscopic burrs to get the edge back to its true ‘V’ shape. HONING STEEL—for realignment that does not grind off metal. DIAMOND HONING STEEL—for realignment plus removing metal; this tool can realign and sharpen. When considering the best kitchen knives available today, the information above should give you a promising idea of what to start looking for. 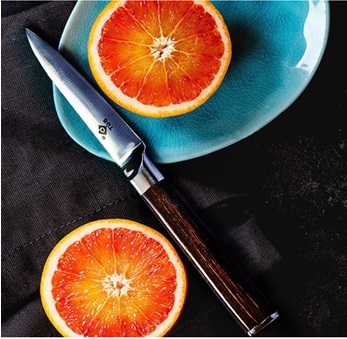 For your next specialty knife or knife sets for yourself or as a gift, please read about ceramic steak knives and sharpening ceramic knives in our kitchen knife reviews detailed here. Precision cutting is necessary for kitchen chemists cutting the perfectly diced onions, the clean colorful carrots cut on a diagonal, and julienned beets for salads using skillfully planned and created knives with you in mind. We base our reviews on positive customer feedback and buying trends.